Atlee Mahorn was a three-time Olympian for Canada (1984, 1988 and 1992). Set a still standing Canadian 200m record (20.17 seconds) while earning a bronze medal at the 1991 world championships. Mahorn was the 1986 Commonwealth 200m champion and finished 5th in the 1988 Olympics 200m final. 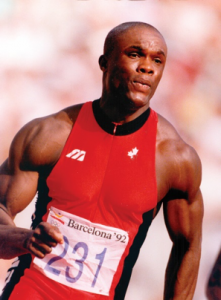 In 1993 he was a member of the Canadian 4 x 100m relay team that earned the bronze medal at the world championships.